Boku Slots enjoy a game that is stunning in design, but it’s even better when it was created by our old friends at NetEnt. Butterfly Staxx is bright, cheerful and pretty beautiful, but what about the features and pay tables? Read on to find out if the beauty is in the eye of the beholder, or if it truly runs deep throughout the heart of this game. 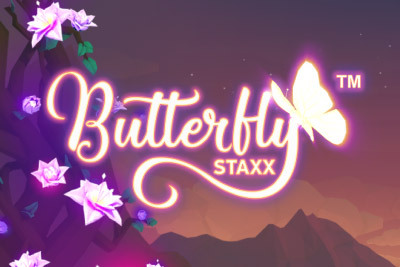 Butterfly Staxx is a 5-reel, 40 pay line game, which offers a stunning RTP of 96.80% for its players to enjoy alongside the gorgeous graphics and animations. Bet Amounts – Betting on Butterfly Staxx begins at just 20p per spin for this fixed pay line game, meaning 40 lines are in play for your minimum 20p bet. You can adjust your bet and coin level if you wish, so the max bet to play is £40. But again this is just the equivalent of £1 per line in play, so still affordable. Always be advised to amend the coin value and coin level before hitting spin, to ensure you have bet the right amount to suit your pocket and balance. Wild Symbol – The wild symbol on Butterfly Staxx is depicted by the word ‘wild’ and is set in front of a bright flower. They substitute for all other symbols except the scatter. 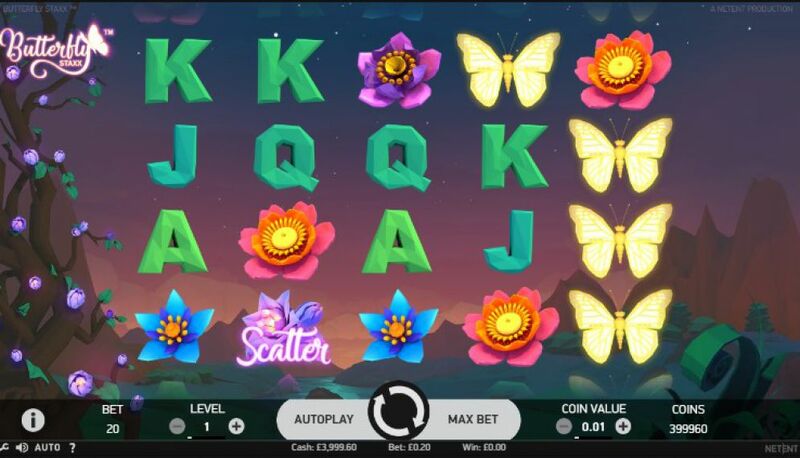 Scatter Symbol – The scatter symbol is depicted by the word ‘scatter’, again set in front of some beautiful flowers. Land three or more scatter symbols anywhere on the reels and you will trigger the Butterfly Spins Feature. Respins Feature – If a stack of butterflies lands on the reel covering it entirely, you will trigger the respins feature. Wherever the stacked butterflies land, they will fly to the left most side of the reels and fill spaces where butterflies are not already in place. The reels will then spin again and if you receive any other butterfly symbols these too will move left and the reels will respin. This will continue until there are no further butterflies on the reels. 5 scatter symbols will award 7 butterfly spins. Once you are into the bonus spins you will see that the symbols have turned to cocoons and as the reels spin some of the cocoons will transform into butterfly symbols. These butterfly symbols will fly over to the left-hand reels and your win will be added to your pot. On each spin more butterfly symbols will emerge from the cocoons and move to the left, creating bigger wins each spin until all bonus spins have been completed. Butterfly Staxx is amazing, creatively designed and so exuberant in colour and animation too. Combine that with the impressive RTP and the fact that the butterfly bonus spin can turn quite profitable, makes it a definite winner for us. The only thing we didn’t like about the bonus spins game is that it could not be retriggered. However it isn’t actually needed, as the wins can be quite big once inside the feature.